What is a Dry-Air Bender? Not all vinyl windows are shaped the same way! Did you ever wonder how we accomplish those geometric patterns in many of the windows you see all over Texas? You know, the round-tops and eyebrows and circles and ovals and other shapes your designers might create? Well, they aren’t easy to make! Bending metal requires soft metal (yes, there are different hardness’s of metal), and bending vinyl is no different. Metal is bent using rollers that “crank” the softer metal into a shape. Vinyl on the other hand, comes in only one measure of hardness and must be softened. In the old days, vinyl had to be soaked for long periods of time in heated glycerin to accomplish the softening. Heated glycerin is old-fashioned, dangerous, smelly, slippery, and potentially unhealthy. It is also very hard to completely remove (rinse) from the finished curved part. 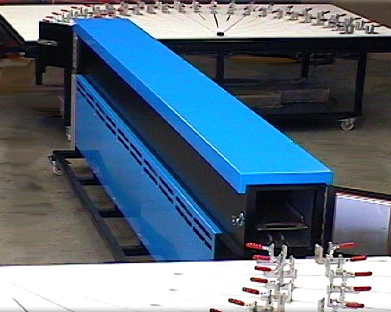 The next generation vinyl bending equipment, like ours, does away with all that wet mess. In the picture above, you can see our “hot box”, a chamber that heats the vinyl with clean and dry hot air, glycerin-free, to soften it for bending on the jig tables shown. When it is ready, the limp vinyl gets pulled from the hot box and fitted immediately into the carefully pre-set jigs where it is left for a few minutes to re-harden. Matching glass and trim is sealed in place to complete your special window.